The recent Sichuan Earthquake in China was so intense, tremors were felt all the way over in the tallest completed building in the world-the Taipei 101 building in Taiwan-a whole eight minutes after the quake originated. (The title of tallest building period was taken by the Burj Dubai back in May.) What's interesting about the 101 is that it has a gigantic suspended tuned mass damper, or hanging ball, which takes up four stories and works like this to prevent the building from falling over and tragically crushing office workers. 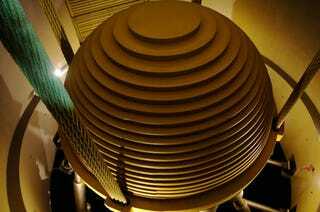 This 730 ton sphere looks intimidating when still, but wait until you see it in motion during the earthquake. The guy in the video keeps asking whether it's an earthquake, in case you were wondering. Deputy Dog dug up this clip, which I then found via DVICE. It reminded me of my own visit to the Taipei 101 last year (see my photos in the gallery above). The ginormous ball, of which the Burj Dubai has nine, was installed on in-place from 41 discrete steel plates because the combined weight of 730 tons would have been too heavy to lift by crane. The people even came up with a nickname for it: the Damper Baby. Don't look at me. The best I could come up with is some combination of "stabilizer" and "testicle". The architects were forced to install it because of high winds and the fact that the Taipei 101 is only 600 feet from a fault line. In order to get up to the observation floor where you can see the top of the ball, you have to ride in the world's fastest elevator. I actually might have my own video of my ride up somewhere, but it's possible that it was deleted shortly after the world's fastest elevator ride turned into the world's stinkiest elevator ride. I had a lot of good food.